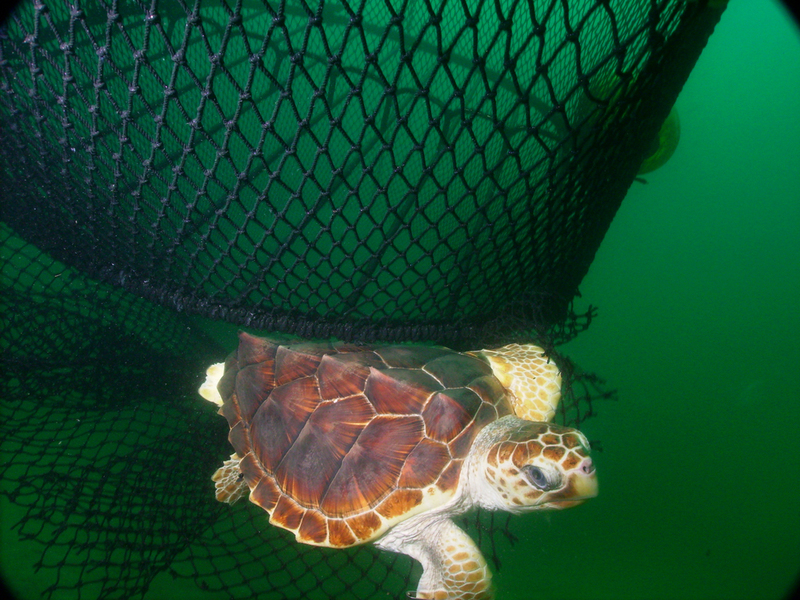 Each species of sea turtle has a few distinguishing features that will help you identify it. Different species have different numbers of prefrontal scales—the small, paired scale found behind a turtle’s nostrils and between its eyes. A turtle’s top shell (or carapace) can also have a different number of plates (or scutes) arranged in a unique pattern. Leatherback turtles are the easiest to identify, as they are the only sea turtle that does not have a hard shell. The shell is black with white spotting, and has 5 to 7 ridges that run down its back. They can grow quite large – up to 1.8 m (6 ft) long and 680 kg (1,500 lbs). The loggerhead turtle has a wide, blocklike head, and four prefrontal scales (two pairs) between its eyes. Its top shell has 5 central plates going down its back, with 5 lateral plates on each side. They tend to be found in more temperate (subtropical) waters. Olive ridley turtles are the smallest and one of the most commonly encountered sea turtles in pelagic, deep-set tuna longline fisheries. Its shell is gray-green, with 5 central plates, and 5 to 9 pairs of lateral plates (the other turtles will never have more than 5). They are more common in tropical waters. 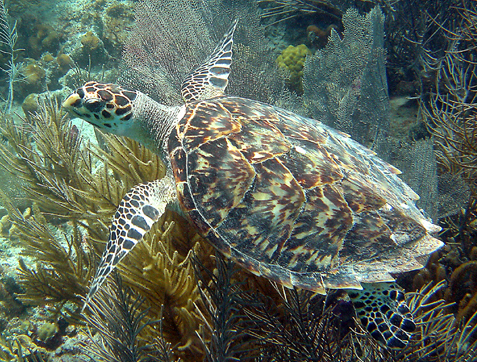 The hawksbill turtle is the most endangered species of sea turtle. It has a sharp, hawklike beak. This is the only turtle whose plates on its top shell overlap, like shingles on a roof. There are 5 central plates, and 4 side pairs. Green sea turtles have just two prefrontal scales between their eyes, unlike the other turtles that have 4 or 5. Despite their name, green sea turtles’ smooth oval shells are a mix of colors (brown and yellow-green in younger individuals, and darker green in adults). They have 4 lateral plates on their shell. They are usually found in warmer waters.